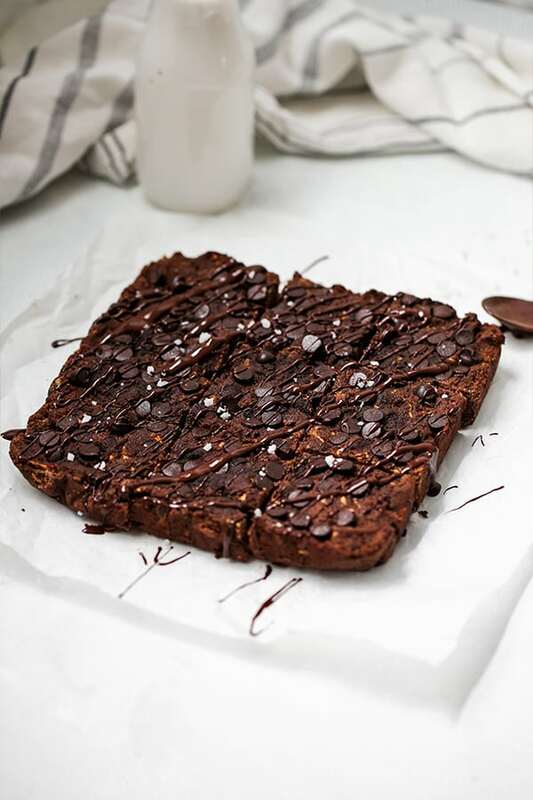 These paleo chocolate zucchini brownies are a delicious treat with a veggie boost! They’re gluten free, egg free, and easy to make AIP! If you would have told when I was a kid that I would be eating vegetables in brownies, I would have laughed in your face. Veggies in dessert? With chocolate? I would have never dreamed of such a thing! 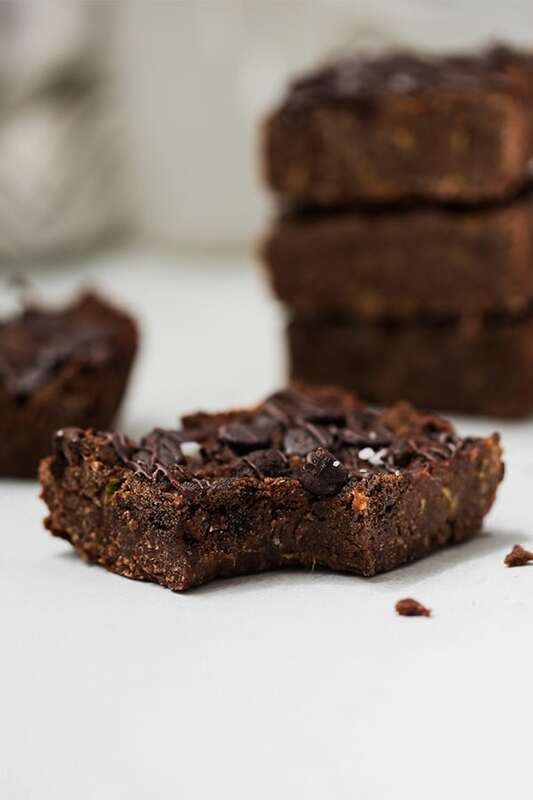 Today, I cannot get enough zucchini based desserts… especially these paleo chocolate zucchini brownies! These brownies are cakey, chocolatey, and taste absolutely amazing. Unlike other grain and egg free recipes, they hold together beautifully and don’t get mushy. You’ll have no idea that they’re free of so many standard baking ingredients like grain filled flours, eggs, and refined sugar. Why zucchini of all things? Why not a fruit? Zucchini is one of my favorite summer veggies and it is perfect for brownies! Extra nutrients! Zucchini is nutrient packed and gives a lot of nutrient value to something that would otherwise be pretty nutrient void. Fiber, fiber, fiber! Fiber is really important, guys. We get so fixated on healthy fats in this space, but we can’t forget about fiber. It tastes amazing. Zucchini has a really neutral flavor and texture when you put it in baked goods. You hardly even notice it’s there! One of my favorite thing about these brownies is that they keep really well in the fridge! A lot of baked goods get dry and gross in the fridge, but these hold up. You can make a big batch and save them for a few days to keep snacking on them. Coconut flour works to absorb excess water which is great for recipes with watery vegetables. I have not tried other flours for this recipe and can’t make any other recommendations. However, I have tons of other recipes that don’t use coconut flour if you can’t tolerate it! This is another flour and binder in the recipe. You can also use honey for the sweetener. Cocoa powder adds more stability to the brownies and is the chocolate component. You can swap it out for carob powder if you’re AIP. To up the chocolate factor, you can add chocolate chips like enjoy life! I use vital proteins gelatin to make gelatin eggs as an egg substitute. If you tolerate eggs, you can swap for those. I haven’t tried a chia egg or a flax egg. To make the gelatin egg (sub regular eggs) pour the water into a small pot and sprinkle the gelatin over top. Let it sit for 2-3 minutes until the mixture hardens. Set the pot on a burner set to low for 1-2 minutes until the gelatin melts (be careful not to burn it). Remove the pot from the heat and vigorously whisk until the mixture becomes frothy. Immediately add it to the brownie batter. Evenly spoon the brownie batter into the baking pan and top with chocolate chips (if using). Bake in the preheated oven for 30 minutes or until brownies are baked through. Remove from the oven and allow the brownies to cool completely before cutting into 9 pieces. 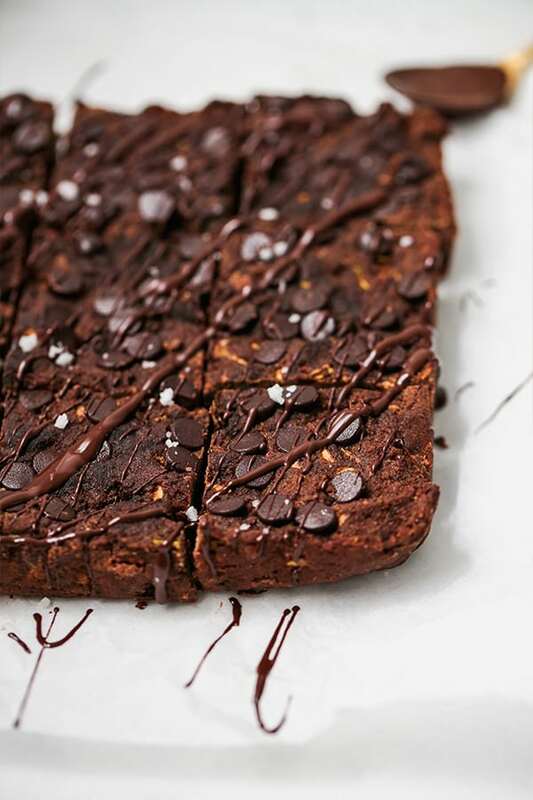 Drizzle with optional melted chocolate and top with sea salt. Note: This recipe contains affiliate links. Learn what that means here. Yum, what a delicious recipe! I’m super grateful for an egg-free recipe since I’m currently not able to eat them! These look amazing! Is it possible to sub monk fruit sweetener for the maple syrup? thank you! I don’t really cook with that so I’m not sure it would work out the same. Let me know if you do! I’m going to try these with flax eggs! I have 2 huge zucchini and while I really want latkes I don’t have the patience to make those. ???? I am so excited about this recipe! Despite the oppressive heat, I fired up the oven and tried it out. The flavor was great, but mine were very dry. Any ideas? Thanks, Melanie! It may be the variety of coconut flour that you used? I find some coconut flours do be a bit more dry than others. The brand I really like is Tropical Traditions. Hope that helps! I feel silly asking this, but how do you shred the zucchini? With a hand grater? can we Substitute arrow root flour for tapioca? Any sub for the tapioca flour- I used it as the recipe called in the apple cake and the gummy texture isn’t too appetising..? Going to try it without peeling the organic zucchini! I haven’t tried it, but it should! Let me know if you do.